Banana is one of those flavors that mixes well with just about any other flavor. We see it mixed in all of the time with fruit flavors, and it is exceptional when it is mixed into a banana cream pie flavor. So this week, we are dedicating some time to the amazing banana flavors that are literally in over 400 different vape juice products on the website. If you have tried a banana flavored vape juice yet, you are definitely missing out. Here are five solid candidates for your approval. We start off this week with Jungle on Ice by Carter Elixirs. Carter Elixirs has made a definite winner with this flavor. It is the second most popular flavor selling on our website as of this week. Jungle On Ice is a perfect mix of banana, pineapple, pear, strawberry, guava and menthol. It has a little of just about everything. If you want that perfect tasting fruit flavor with just a touch of menthol cool ice, then this is it! No wonder this is a favorite! We have it available in 120ml bottles and five different nicotine levels. It is currently $20.00 a bottle. Next up on our list for the week is Ill Nana by Carter Elixirs. Here is yet another amazing fruit flavor from Carter Elixirs. 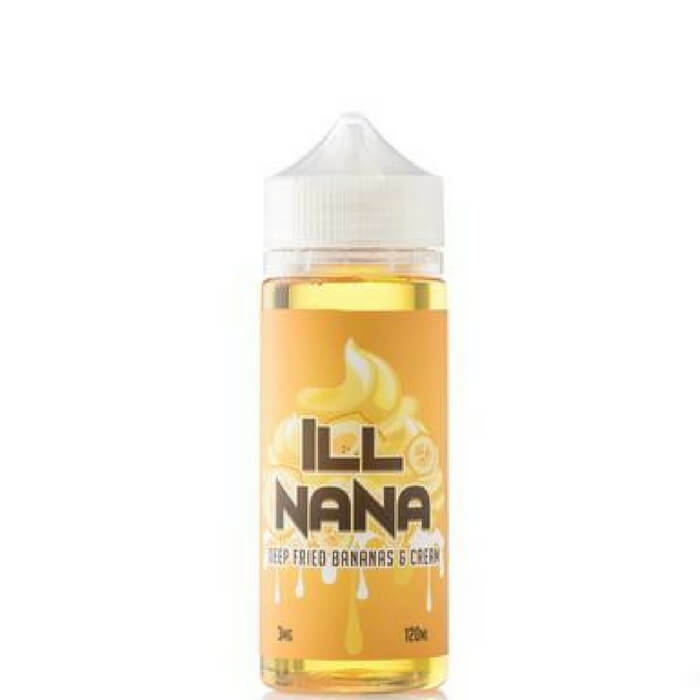 Ill Nana is an amazing mash-up of banana, caramel, and a touch of powdered sugar. It mixes those flavors ever so nicely too. YOu get a strong banana taste on the inhale, and a sweet candy, sugary flavor on the exhale, leaving you wanting more and more. We have this available in 120ml bottles, and five different nicotine levels. It is currently $20.00 a bottle. Jungle Juice by Carter Elixirs is next up on our list. So here we are with a third flavor from Carter Elixirs. Yes, we are amazed by the quality of the Carter Elixir products, and what can I say... they do banana quite well. Jungle Juice is a mix of banana, pineapple, pear, strawberry, and guava. The only different between this and Jungle Juice On Ice listed above, is that this does not contain menthol flavor. It has the same amazing mash-up of fruit flavors, and I guarantee that you will love this vape juice if you love sweet fruit flavors. We have this available in 120ml bottles and five different nic levels. It currently runs $20.00 a bottle. Number four on our list for the week is Banana Bread Puddin' by Country Clouds E-Juice. Country Clouds puts together some amazing dessert vapes. If you haven't tried one of them yet, I sincerely suggest that you do. They are amazing. Banana Bread Puddin' is no exception. The flavor of this vape juice is really spot on. YOu cannot ask for a better tasting banana dessert vape. I sincerely doubt that you will find anything better out there as far as banana goes. Country Clouds also puts out the amazing popular flavor Corn Bread Puddin'. We have Banana Bread Puddin' available in 60ml bottles and three different nicotine levels. It currently runs $19.95 a bottle and is definitely well worth it! Last but not least is Donkey Kahn by Humble Juice Co. eJuice. Donkey Kahn sounds like something straight out of a 1980's video game... It is a mix of a sweetened banana mix with candied strawberry and dragon fruit. This is another one of those amazing fruit mash-ups that makes for a very sweet tasting fruit explosion on every vape. The candied strawberry gives it that extra sweet taste on the exhale that definitely tells you that this is a candy vape as well. we have this available in 120ml bottles and three different nicotine levels. It currently runs $17.99 a bottle and is on sale at 25% off. With hundreds of banana flavors on our website, you can look through them individually by CLICKING HERE. We have them sorted for you by best selling. You will definitely find all five ejuice products listed above at the top of that list, plus literally hundreds more. You can also check out our DAILY DEALS that have some incredible juice products on sale ranging from 20% up to 70% depending on the brands. So, until next week... Have a GREAT week!